Painting and stenciling terra-cotta pots is a fun and inexpensive way to enhance your patio or garden decor. 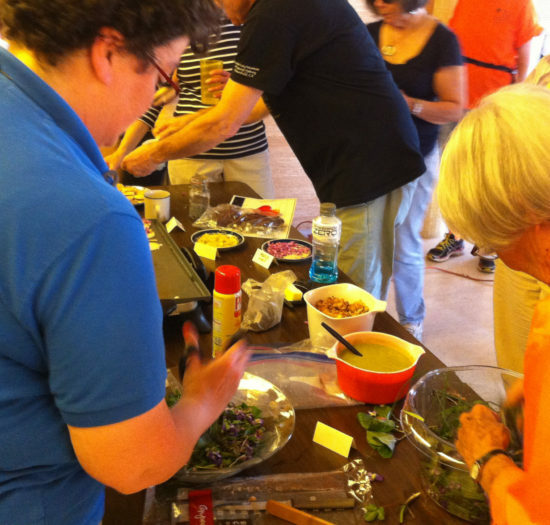 Younger and older crafters alike can join in. Small decorated pots can be used as party favors. Medium-sized pots might provide the base for a table centerpiece. A large pot could function as a gift basket that you can fill with items for a loved one who likes gardening. Gardeners can always use extra small items such as gloves* (they tend to wear out with regularity), seeds*, bulbs*, bug repellent*, gardener’s soap, hand lotion*, sunscreen*, lip balm* and plant tags*. You can also throw in a gift card* so they can get exactly what they want! You can use either a brand-new terra cotta pot or a used one. I kind of like a used one for this project because I’m going for an artificially aged or distressed look and and that’s easier to achieve if the pot already features some stains from being used. A brand new pot will work also. 1. Clean and dry your pot. 2.Using your acrylic paints, mix a terra cotta color that is lighter than your pot. Good colors to use in the mix are white, brown, orange and maybe red. 3. Put some water-based varnish in a small container and mix in some of the light terra cotta color. Brush some inside your pot to see how translucent it is. I used a stiff brush that was about 1″ wide. You should be adding a light, translucent haze of color in which you can see some brush strokes. Paint the whole inside of the pot and let dry. This step achieves two objectives – it seals the inside of the pot and tests your mixture to make sure it’s right – not too opaque and not too transparent. Normally one of the benefits of a terra cotta plant pot is the porosity, but since we’re applying paint to ours we don’t want water seeping through and wearing off the design over time. Set aside the remainder of the paint/varnish mixture to use later. 4. On your palette, squeeze out some green, yellow and white paint. Use a sponge to blend these colors in random ways and lightly sponge paint onto your pot in random areas. This is to simulate lime scaling and moss or algae that would normally appear on a terra cotta pot over time as it’s in use. After this paint is dry, if you need to tone it down any you can sand it lightly or sponge a litte of your translucent light terra cotta color over it. 5. The next step is to apply a loose vertical texture to the rim of the pot to accentuate it. I used a Memory Essentials Get Rollin’ tool with rubber bands on it from the set Memory Essentials Bits and Pieces. This is one of my favorite textures of all time and I’ve used it in paper crafts, fabric surface design and all kinds of random projects over the years. If you don’t have these tools you can create a similar texture tool by wrapping rubber bands or string around a wood block. Spread some cream-colored paint on your palette and run or press your tool in it then apply to the rim to make the texture. Let dry. 6. 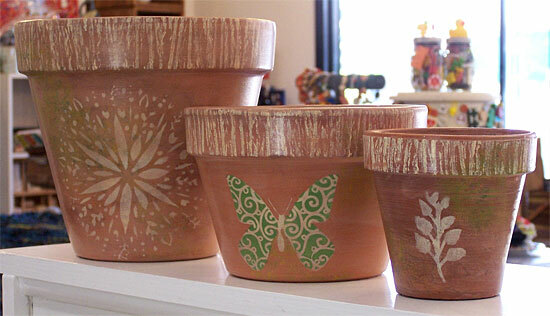 Select a stencil or stencils for applying a design to the side of your pot. You might want to use letter or number stencils to create names, initials, words or house numbers. In my examples I used decorative stencils in garden-related designs. Temporarily tape the stencils to the side of the pot with masking tape. Put some cream-colored paint on your palete (do not thin with water) and apply paint through the stencil with a dry sponge. When you’re done, pull off stencil and either wash paint from stencil immediately or put in a container of water to wash later. If your design requires more than one color, use a clean dry sponge for each color – a moist sponge will make your paint run under the stencil and mar the design. While you’re working, if you don’t want to pause and go to the sink to wash paint from your stencils, brushes and sponges at each step, throw them in the container of water until you’re ready to do cleanup at the end. Let stenciled paint dry on pot. 7. Take a look at your pot and see if you like the appearance the way it is or if you want to make it a little more distressed. Randomly hit some areas with sandpaper if you want to “age” it a bit more. Wipe off dust with a slightly damp rag. 8. Paint outside of pot with your translucent light terra cotta / varnish mixture. Let some brush marks show, but smooth them out a bit if you think they are too prominent. Turn pot over and paint the bottom to seal it. Let dry. You’re done! If you want to take the idea of using a decorated pot as table decor or a party favor a little further, here is an idea you might like from my personal blog. 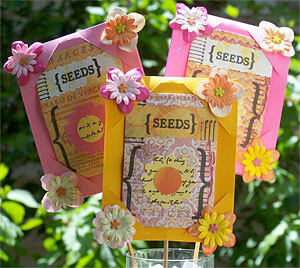 Make a bouquet out of seed packets with free templates that I provided for download and display it in one of your decorated pots. 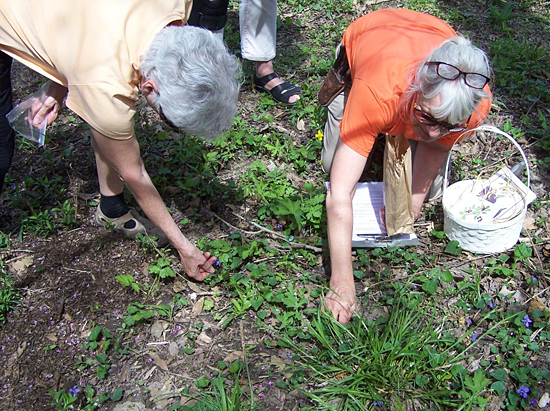 Every gardener has his or her own criteria for choosing favorite plants. I started my garden in very challenging conditions – in part shade and soil that was more like concrete than soil and with a high clay content. I had to try to find plants that would survive in those conditions. I also enjoy plants that are functional, either for their qualities as a culinary or otherwise useful herb, for their role in attracting beneficial insects to the garden for pest control, or for providing habitat or food for wildlife which I like to watch and study. This is the season for plant sales – see our calendar for gardening sales and events as well as suggested planting dates. Some plant sales feature extras raised by local gardeners. These plants may do better in your garden than a plant from a large retailer that could have been shipped from a long distance away and is not adapted to local conditions. Another reason you might want to consider buying plants from a local plant sale instead of a large retailer is that some commercial growers treat their plants with systemic pesticides that are a grave danger to bees, butterflies and other pollinators. Some consumers have purchased milkweed plants to help monarchs and ended up killing them instead! Read about it in this article: How to help monarch butterflies (without poisoning them). If you want to add some new plants to your garden here are suggestions of some of my favorites and reasons why I’m fond of them. I live in Brentwood, MO so these plants are proven to grow in the St. Louis area. Before you go shopping, you could also try using the Missouri Botanical Garden Plant Finder to select plants that fit your conditions and criteria. For example you might want plants that flower at a certain time, have a certain color, are deer-resistant, grow in a wet area, get to a certain height or other characteristics of your own choosing. With the help of the plant finder you can make a list to bring with you so you don’t end up buying plants that aren’t right for your garden. “The right plant in the right place” is a well-known saying that is by far the most important thing to consider for gardening success! My favorite color is lime green. There are few colors that don’t look better next to lime green in my opinion and it’s an especially nice color for brightening up a shady garden. 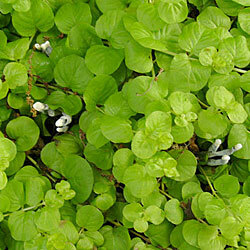 It fills in nicely around other plants and is short in stature so other plants grow well through it. Also looks nice trailing from containers or over barriers or short walls. Unfortunately the beautiful branchlike fungus shown in this picture does not always grow with it! It is not native to Missouri and might need a little maintenance to keep it from spreading into areas where you don’t want it. May become invasive. Reasons I like this plant: I’ve made homemade Horehound candy and teas to alleviate coughs from this plant and found it more effective than any over the counter cough remedy I have tried. It does need a fair amount of sugar to taste decent but delicious if sweetened enough. The leaves are pretty durable and they usually look good until well into cold weather. 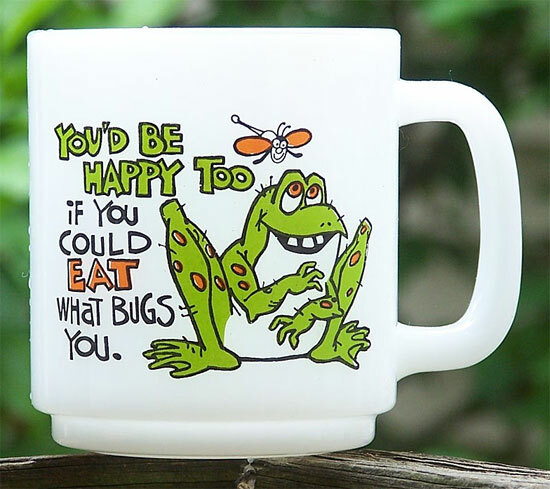 I’ve never seen it bothered by pests. Horehound can be grown from seed – my plants are descended from a plant that I bought for my Mom in memory of her Dad, who loved Horehound candy! We sell Horehound candy at Schnarr’s if you would like to try some without having to make your own. 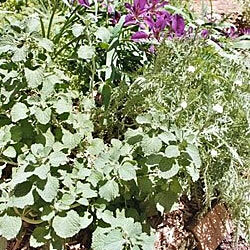 The Horehound is toward the front of the photo and has the wrinkly leaves. Possible drawbacks to this plant: Not native to this continent. 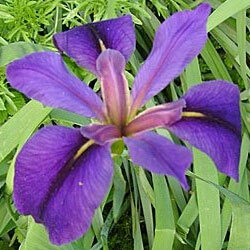 It is reported invasive in some areas but for me it’s not a spreader, possibly because of my part-shade conditions. 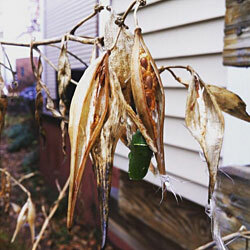 Reasons I like this plant: The picture shows the milkweed looking brown and dried up in the fall, but also shows what I like best about it – a monarch chrysalis! Swamp Milkweed provides food for monarch caterpillars and nectar for many other pollinators. The flowers are beautiful and in my opinion worth the plant not looking that great at the end of the season. If like me you like to watch winged wildlife this is one of my best attractors when in bloom. Try planting some tall late-flowering annuals around it to help disguise the dried up stems. It is native to Missouri and can be grown from seed. Possible drawbacks to this plant: Not very attractive looking in late summer and fall. Reasons I like this plant: I have a variety of types of Columbines but a Missouri native is the one shown in the picture. 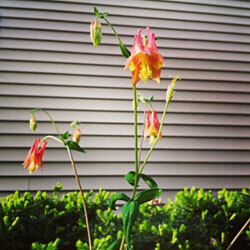 Some Columbines can be grown true from seed, and they usually reseed themselves pretty readily. In a recent storm, a hybrid Columbine with larger flowers was partially knocked over but the native with the smaller flowers was not affected. That’s one drawback to oversize flowers that are sometimes bred into plants – they can be too large to be supported by the plant in rough weather. All of my Columbines, species or hybrids, attract lots of beautiful hummingbirds. Possible drawbacks to this plant: Foliage is very pretty in spring but might be attacked by leaf miners later in the season. The plant won’t be killed but the leaves won’t look very attractive. To fix this, wait until the plant is done blooming and cut all the foliage back after you see a leaf miner infestation. The foliage will regenerate without the leaf miners and probably will not be re-infested since the time of activity for the leaf miners will be over. The MOBOT plant finder says the native species is more resistant to leaf miner than other varieties. My plant is three years old and didn’t bloom until this year. I don’t remember whether the foliage had leaf miners in previous years or not but I will check to see this year if it really is resistant. I know my other Columbines were affected as they always are. Columbines are usually short-lived so save some seeds in case it doesn’t reseed on it’s own – but it probably will! If you want to read about all the other types of Columbines just do a search for “Aquilegia”. Reasons I like this plant: It reseeds itself here and there which in my informal garden looks nice but could be a problem depending on what kind of garden you have. I like how it pops up around the garden because it doesn’t get very big and a bit of white here and there in a garden really helps the appearance in my opinion. It has a reputation for having medicinal properties. 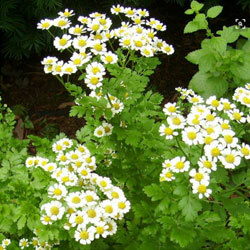 Feverfew attracts a lot of the small bees and wasps that are beneficial in the garden. Makes a nice dried flower. 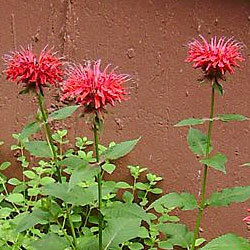 Possible drawbacks to this plant: It is not native to this continent and is now considered naturalized in North America. Foliage sometimes doesn’t look good toward the end of the summer – apparently it gets attacked by some kind of sucking insect that makes it look a bit mottled but the plant does not seem to be harmed. It could get weedy, I sometimes find young plants in the lawn, but once you pull it out it’s gone, it doesn’t leave behind tubers or rhizomes or anything like that. It’s supposed to be short-lived but I’ve never noticed that because it reseeds reliably. Reasons I like this plant: It’s very easy to care for – it doesn’t need much more than to be brought indoors during cold weather and left outside to catch rainwater in the warm months. 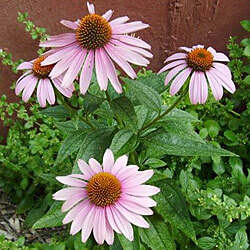 It’s native to the deserts of South Africa and Tanzania so give it good drainage. You might want to put it in a larger pot every few years as it slowly expands. 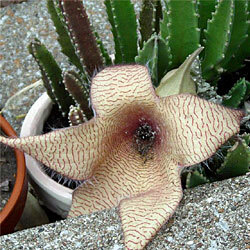 It’s a great houseplant/patio plant if you have a taste for something on the weird side! The inside of the large flowers have an unusual brain-like texture and the plant emits a smell like rotting meat to attract flies to pollinate it. A real conversation starter! When not in bloom, it looks like a nondescript green cactus-like succulent. Possible drawbacks to this plant: It smells really bad when in bloom and would need to be moved outdoors during that time. The first time mine bloomed we thought there might be rotting chicken around and we checked the fridge and trash can! Reasons I like this plant: This plant is very easy-care. Mine are descendants of irises that were planted in my parents’ yard in the 1980s and went dormant for a couple of decades before reappearing when a tree near them partly died out and some of their sunlight was restored. My parents originally got them from my Dad’s aunt. I moved some to my garden and they have multiplied enough to be growing in three locations now. I’ve always liked them but recently after studying for my bulbs test I decided to research exactly what kind they are and I discovered that the original species plant is native to Louisiana and perhaps Texas also. The species is endangered in its native range. Mine appear to be a hybrid or cultivar and not the species plant but I’m not sure which one it is. Based on pictures I’ve seen online it looks a lot like the cultivar ‘Black Gamecock’. Possible drawbacks to this plant: Needs to be divided after several years when it gets so crowded it stops blooming. The rhizomes are really large and may not be easy to remove if you ever decide you don’t want them. You also may need to thin them to stop them from spreading too much. Reasons I like this plant: The species plant can easily be grown from seed. Mine has both white and lavender colored flowers on it which was a nice surprise – I got the seedling from my Mom and Dad’s yard which had all lavender colored plants in it. If you like winged wildlife in your garden Rose of Sharon flowers will draw seemingly every bee, butterfly and hummingbird in the neighborhood. The seed pods will be relished by birds in the winter. The beautiful goldfinch is one of three species I’ve observed feeding on mine. Once established this plant needs almost no care. I say almost no care because my Dad prunes his. I’ve never pruned mine and it’s doing fine but now that I know a bit about how and why to prune from my Master Gardener class I may remove some branches that are rubbing together. My Dad has accidentally killed some of these plants by pruning them too much but I have never seen one die of natural causes or have a noticeable pest issue, and I grew up with bunches of these as hedges in our yard. Possible drawbacks to this plant: It is not native to this continent and could be invasive. Produces a lot of seedlings which are not always easy to pull up because they are woody and have a long taproot. I control most of the extra seedlings with lasagna gardening around the base of the plant and pulling the seedlings when small. It’s a little extra effort to control the seedlings – not so much that it’s a problem for me but some people really hate this plant because of that. Reasons I like this plant: It’s native to Missouri and will naturalize in the right conditions. I was given four plants in a swap two years ago and this spring they finally have started to spread a little bit – I counted 17 yesterday! I have room for more so it can spread for awhile without bothering me. 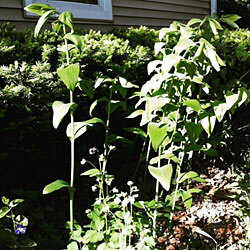 You are probably noticing a pattern in the kinds of plants that become my favorites – they tend to spread or naturalize. In a formal garden this may not be a good thing but I like to get extra plants because I have a lot of space to fill in an area where it’s hard to get anything to grow so I’m grateful when I find plants that like my conditions! I also like to have extras for trading stock since most of my really good plants have been acquired by trading, not purchasing. In the front garden where large oak trees shade it for a lot of the day, I need plants that look good in a woodland setting and it pleases me to find a beautiful tall plant to contrast with all the nice groundcovers I have! The large leaves almost look tropical, it doesn’t really look like a “wildflower” though that’s what it is. Possible drawbacks to this plant: I don’t know of any other than it might spread too much for some situations. Reasons I like this plant: This plant ticks off almost all the boxes of what I really want – attracts wildlife, is native, naturalizes, is a useful herb, is fragrant, grows in part shade – and as an extra bonus – it’s RED! Red and blue are my favorite flower colors but there aren’t many plants in those colors that will grow reliably for me. I finally got this species to “take” in my garden after three tries and these days it’s spreading all over the place. A sea of red makes me happy so I am THRILLED. I finally have enough so that they will need to be thinned and I can trade some. Red is also the favorite color of hummingbirds – they will feed off of other colors of flowers if they are suitable but seeing some red helps them find the other flowers. The round seed heads look good dried and provide winter interest if you leave them standing. 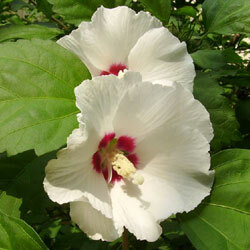 Possible drawbacks to this plant: Foliage tends to look bad late in summer and is susceptible to powdery mildew. Some cultivars are supposed to be resistant. Most of my Bee Balms get the powdery mildew at least a little bit but in my case it doesn’t seem to kill the plant or spread to other species. I’m willing to put up with it to get red flowers! Once you get it in conditions it likes, it does spread a lot so in some situations that could cause maintenance issues. Reasons I like this plant: Beauty is enough reason to grow it. This is also a useful plant for supporting wildlife – bees and butterflies will enjoy the nectar and it’s famous for feeding goldfinches with the seeds. It’s native and will create new seedlings which can be transplanted if they are not in a convenient place. It took several years (about 8?) before I had enough seedlings to start moving them to other spots in the garden. There are lots of cultivars in really nice colors but they are not as vigorous as the species, so as tempting as those other colors are I’ll stick to the species! Possible drawbacks to this plant: It’s kind of slow growing so you have to be patient. I leave the dried plants standing in the fall when I can to feed birds in the winter but some people think the dried stems are unattractive. You might have to cut them down if they are in a conspicuous spot if you have fussy neighbors. Someone will want the seeds if the birds don’t get the chance to eat them.